Gathering against privatization, March 11. 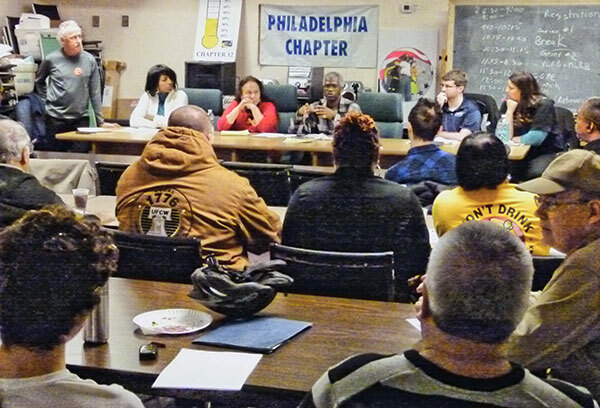 Philadelphia — Against a background of mounting attacks on public employee unions here, community and labor activists came together March 11 to address their common crisis at a forum against the privatization of postal, education and other government services. The meeting, held at Service Employees Local 668 union hall, was co-chaired by retired letter carrier Joe Piette and Johnnie Stevens, a New York City community activist, both members of Community Labor United for Postal Jobs and Services (CLUPJS). Stevens began by stressing the importance of organizing community support for the unions that provide vital services. He discussed his recent experience with Parents to Improve School Transportation (PIST) in galvanizing the community behind striking New York City school bus workers trying to defend their union. Stevens also gave the example of youth in Harlem, active with the Occupy Wall Street movement, who took over a post office to drive home the point that postal jobs are one of the few places youth without higher education can get jobs with decent wages and benefits. Piette told the crowd: “Whether we’re postal workers, teachers, state store workers, city workers or neighborhood activists, the drive to privatize adversely affects all our communities. The services we provide are not only decreased or eliminated, but lower-paid jobs through privatization mean more poverty for our neighborhoods. Rosa María de la Torre of CLUPJS talked about how the organization came about in the Chelsea area of New York, where she has worked as a tenant organizer for 18 years. “We knew all the issues are linked,” she said. “CLUPJS is now a national organization dealing with a very local, very intimate neighborhood issue. With privatization, everything will be more expensive. We are already seeing the impact of these attacks on our block with mom-and-pop stores boarded up and replaced with banks and Starbucks. … ‘Affordable’ housing is geared to people making $75,000 and up. … This is affecting the quality of life of everyone in our area. Along with our local post office, tenants, seniors, youth and postal workers are all on the list to be shut down,” she concluded. Several members of United Food and Commercial Workers Local 1776 talked about Pennsylvania Gov. Tom Corbett’s campaign to privatize 600 state stores that sell wine and spirits. Local 1776 representative Chris Naylor explained how legislation currently in Harrisburg [the state capital] would result in the loss of 5,000 good-paying union jobs, along with retirement security and health care benefits. Danyell Dahn, a Philadelphia Federation of Teachers member and an organizer with the Teachers’ Action Group, said the efforts to sabotage the post office are exactly like what is happening with education. “The issue is about inequality. It’s not about an achievement gap, it’s about an income gap,” she said. Gwen Snyder, executive director of Philadelphia Jobs with Justice, commented that the SRC had a plan to close the schools years ago. “Corporate America’s plan for this decade is to privatize the hell out of the public sector and destroy the unions. 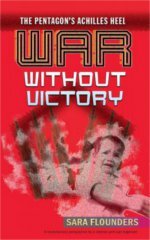 We have been constantly fighting a defensive battle. We need to be voting with our feet to expose the lie that ‘privatization is good for the people.’” Snyder was one of 19 demonstrators arrested attempting to stop the March 7 SRC meeting when they voted to close schools. A lively discussion followed the speakers. One person commented that the sale of wine and spirits in convenience stores would keep a lot of young people from getting summer jobs since workers must be over 21 to sell alcohol. Another called for a movement like the Montgomery Bus Boycott to boycott any agency attempting to privatize. Patrice K. Armstead with Building People’s Power spoke of the need to educate parents on the history and value of public schools and to let them know how detrimental it is to privatize.